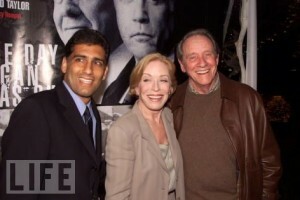 Writer/Director Cyrus Nowrasteh with Holland Taylor (Nancy Reagan) and Richard Crenna (President Reagan) at the Paramount/Showtime premiere. 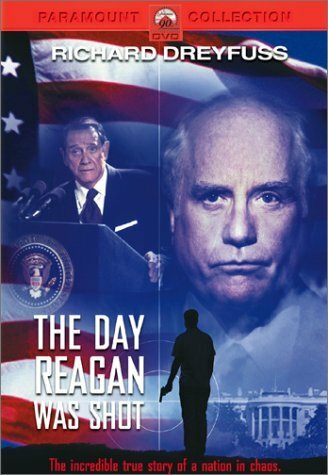 THE DAY REAGAN WAS SHOT is the much-acclaimed riveting true story, written and directed by Cyrus Nowrasteh and executive produced by Academy-Award winner Oliver Stone. On March 30, 1981, at the height of the Cold War and in office only seventy days, President Ronald Reagan and three members of his entourage were gunned down by an insane and obsessive young man named John Hinckley Jr. outside the Washington Hilton Hotel. With Vice-President George Bush on a plane and Reagan’s condition critical, egos clashed, tensions mounted, and chaos ensued. In an executive crisis that threatened not only the life of the president, but the survival of the nation as well. Academy-Award winner Richard Dreyfuss stars as Secretary of State Alexander Haig, the man who stood at the center of this never-before-dramatized political meltdown which brought us to the brink of war and challenged the integrity and authority of both our leaders and the constitution itself. Inspired by actual events, THE DAY REAGAN WAS SHOT is a terrifying and hilarious vision of politics at its best, worst, and most dynamic.